This thread will be used to document the technical information and any schematics or firmware available to help troubleshoot and repair the OBC/Converter. Post #2 has troubleshooting steps and an index of this thread that can hopefully be used as a guide to step through the process. 20. PM message, 10/2018, from tdigsi; looking for substitutes to replace the 680 and 220uF capacitors? 19. PM message, 9/2018, from Quixotix in Seattle; dealer says charrger is dead; recommended to request DTCs and open cover to inspect for damage, blown fuse, etc. 16. footswitch, 9/2018, 2012 not charging in Portugal, EVSE charging appears to start, then just quits, DCDC appears to work ok, still running with OEM Aux battery. 15. charliejuliet, 8/2018, failed charrger in Michigan UP, replaced with aftermarket DC/DC and Chademo charrger. 14. redcane, 8/2018, 2010 not fully charging in Australia (east coast), OBC was replaced with a 2015 unit under recall in January 2017. 13. skylogger, not charging in Western Australia, found blown surface mount capacitors. 11. mikedufty, 3/18, 2010 Australian model not charging fully in WA, charrger was replaced under recall. 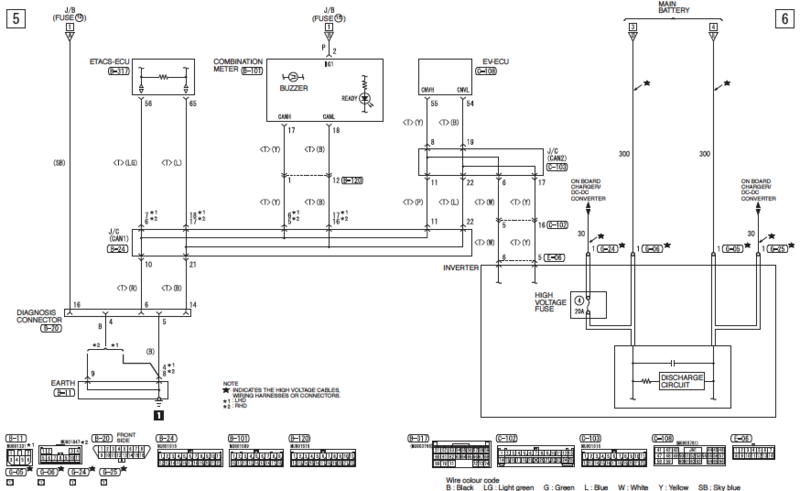 Dealer now pointing at EV-ECU as bad. 7. luvmymiev, 6/18, Category: i'll take bad charrgers for $4000--The question is:What did the dealer find? 6. electronpusher, 6/18, car not charging in New South Wales, blown snubber capacitors in the potted doghouse and fuse in the MCU. 5. Antaris, 3/18, service manager says the on board charging unit has failed. 4. fresnomiev, 3/16, dealer replaced charrger while troubleshooting by parts swapping, issue was MCU inverter. 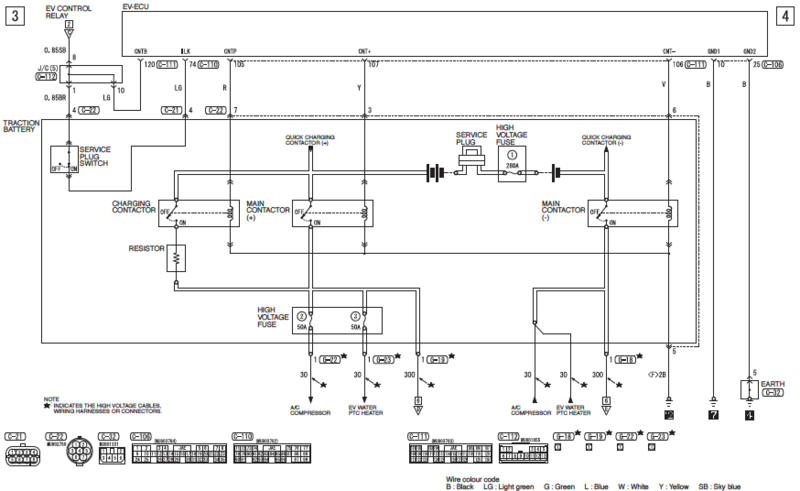 Here are some wiring diagrams just to get started, will post a charrger schematic after it gets traced and drawn up. Last edited by kiev on Tue Jan 08, 2019 7:13 am, edited 75 times in total. Don't disconnect AC power while charging--use the J1772 handle button or the remote for a controlled stop. Step 4: At this point the dealer has no real repair options but to sell you a new box, or you can find a used one and replace it--it will work without any VIN re-coding needed according to jray3, who did this himself, or you can open the box and inspect for missing/burnt parts and we can try to fix it here. or maybe you could send it to an expert in Australia (coulomb or skylogger), or in USA (piev or kiev). It's heavy, ~27 lbs. Another option may be to altogether replace the OEM charrger and converter with an aftermarket solution, such as was done here by charliejuliet. Last edited by kiev on Sun Jan 06, 2019 6:29 am, edited 39 times in total. Connectors make for quick and easy installation, but they are the most likely candidate for intermittent issues. The sliding contacts are prone to oxidation and dirt. Sometimes just disconnecting and cleaning the contacts with spray can of cleaner compound will provide a fix. With key OFF, just pull all the connectors on the EV-ECU and the BMU and clean all of them. Thx Kenny, I’ll add to #8 that both my DCDC and charger failed at the same time, fixed by replacing with a collision salvage unit. Simply opening and reconnecting a wiring connector will renew the contact surface and break up corrosion, but a cleaning spray like DeOx-it could only help. It appears that the 20 amp 400 VDC fuse I blew is both the charging output and the DCDC input, would you agree? That makes me suspect only one of those two actually failed. the list has nearly doubled in the last week! High temperatures to blame? I bought my 2012 used with 50,000 km (30,000 miles) on it so I don't know its history. For the past 2 years I have been charging it only on 120 V L1 (8 amperes?). I was curious what rate the cars with charger failures have primarily been charged with. A few of them are from Australia where it is winter so probably not high temperature. Mine went in May, which was unusually warm this year (30 C) but still not summer temps. Australian ones charge at 240v so more than the US L1. DC fast chrging doesn:'t use the onboard charger so should not be a factor. RobertC wrote: A week ago one of my 2012's would not charge. I connected Canion and it showed that all 88 cells were the same voltage, ruling out a bad battery pack. When I connected the EVSE the fan would start on the battery pack as usual, and the EVSE would indicate charging, but would shut off after a few seconds. I connected another EVSE and had the same results, ruling out a bad EVSE. I suspected a bad On Board Charger. The local Mitsubishi dealer (Sport Mitsubishi in Orlando - I've had several great experiences with them) agreed, and replaced the On Board Charger (over $4,000 for the part, over $5,000 with labor) under warranty and we are back in business. I dropped the car off Monday afternoon, and picked it up Saturday morning, and they also performed the latest recall and installed new tires. I asked Sport Mitsubishi if they offered an extended warranty and was told that they did not. Our 5 year 60,000 mile power train warranty expires in May of this year for those of us who bought the i-MiEV when it was rolled out nationally in May of 2012. I repair electronics for a living now, so if the On Board Charger fails after the warranty expires I'll have a go at repairing it myself or I'll try to buy a used one because I'm not paying over $4,000 for a new one. My On Board Charger failed on my lower mileage (30,000 miles) i-MiEV “Purple” April 2017 and was replaced under warranty. I posted my concerns at the time but did not receive any feedback on this forum. I recently sold my other 56,000 mile i-MiEV “Silver” and was glad the On Board Charger had not failed yet since it was out of warranty. I also estimate the i-MiEV that I sold had between 60-70% of its original battery capacity. 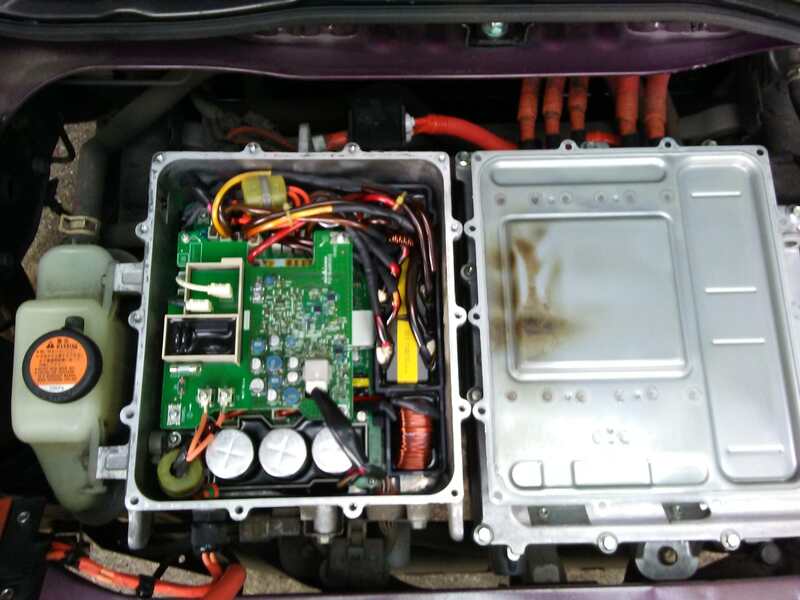 After reading the EV-ECU DTCs, the dealer should use the MUT3 to read down into the Data List from the OBC to get the Internal Diagnostic Code from the OBC / DC Converter box. 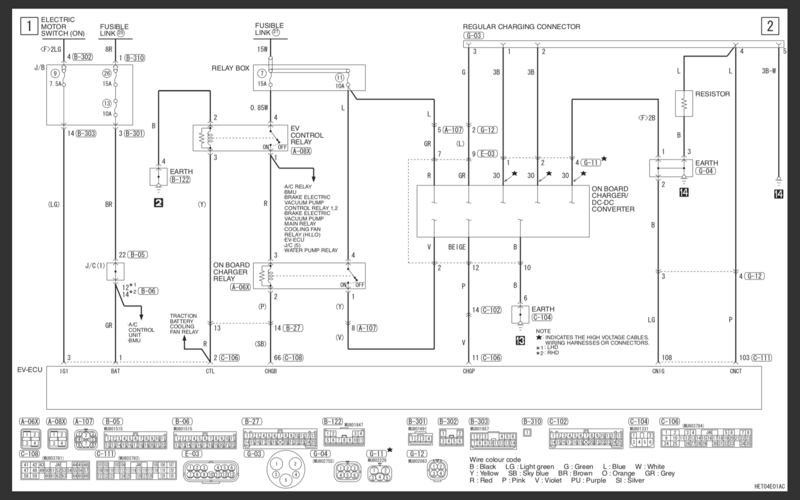 This gives specific circuit malfunction information that can help give us some idea of which circuits to investigate. For most of these, the first time it occurs, the OBC will store the code. If it happens again at the next charging, then it throws the code up to the EV-EVU that a malfunction has occurred. This should cause the trouble light on dash to be lit. A few are so serious that a malfunction is indicated at the first instance. Last edited by kiev on Sun Sep 02, 2018 8:33 am, edited 5 times in total.